These are a pair of natural untreated emeralds from Zanzibar Africa.This is from mine run material so it is heavily included so it is priced accordingly.It has been faceted and polished in Zanzibar but the cutting can be improved. Emerald is a gemstone, and a variety of the mineral beryl (Be3Al2(SiO3)6) colored green by trace amounts of chromium and sometimes vanadium.] Beryl has a hardness of 7.5–8 on the 10-point Mohs scale of mineral hardness. Most emeralds are highly included. Scientifically speaking, color is divided into three components: hue, saturation and tone. Emeralds occur in hues ranging from yellow-green to blue-green, with the primary hue necessarily being green. 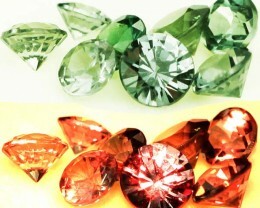 Yellow and blue are the normal secondary hues found in emeralds. Only gems that are medium to dark in tone are considered emerald; light-toned gems are known instead by the species name green beryl. The finest emerald are approximately 75% tone on a scale where 0% tone would be colorless and 100% would be opaque black. In addition, a fine stone should be well saturated; the hue of an emerald should be bright (vivid). 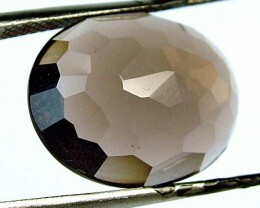 Gray is the normal saturation modifier or mask found in emerald; a grayish-green hue is a dull green hue. Emeralds are green by definition (the name is derived from the Greek word "smaragdus", meaning green).] Emeralds are the green variety of beryl, a mineral which comes in many other colors that are sometimes also used as gems, such as blue aquamarine, yellow heliodor, pink morganite and colorless goshenite. Clarity Emerald tends to have numerous inclusions and surface breaking fissures. Unlike diamond, where the loupe standard, i.e. 10× magnification, is used to grade clarity, emerald is graded by eye. Thus, if an emerald has no visible inclusions to the eye (assuming normal visual acuity) it is considered flawless. Stones that lack surface breaking fissures are extremely rare and therefore almost all emeralds are treated ("oiled", see below) to enhance the apparent clarity. Eye-clean stones of a vivid primary green hue (as described above) with no more than 15% of any secondary hue or combination (either blue or yellow) of a medium-dark tone command the highest prices. This relative crystal non-uniformity makes emeralds more likely than other gemstones to be cut into cabochons, rather than faceted shapes. Most emeralds are oiled as part of the post-lapidary process, in order to improve their clarity. Cedar oil, having a similar refractive index, is often used in this generally accepted practice. Other liquids, including synthetic oils and polymers with refractive indexes close to that of emerald such as Opticon are also used. The U.S. Federal Trade Commission requires the disclosure of this treatment when a treated emerald is sold.] 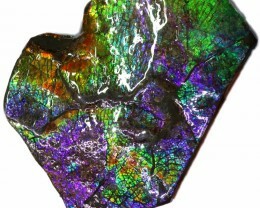 The use of oil is traditional and largely accepted by the gem trade. Other treatments, for example the use of green-tinted oil, are not acceptable in the trade. The laboratory community has recently standardized the language for grading the clarity of emeralds. 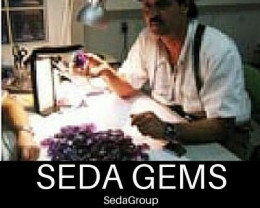 Gems are graded on a four step scale; none, minor, moderate and highly enhanced. Note that these categories reflect levels of enhancement, not clarity. A gem graded none on the enhancement scale may still exhibit visible inclusions. Laboratories tend to apply these criteria differently. Some gem labs consider the mere presence of oil or polymers to constitute enhancement. 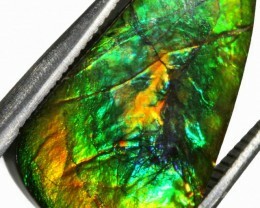 Others may ignore traces of oil if the presence of the material does not materially improve the look of the gemstone.